my take: This has been on and off my to-read pile for a long time. I was excited about it when I first heard about it and then just wasn't in the mood for it. When I finally pulled it off the pile, I read it in two sittings (into the wee hours). A strong heroine (flawed but triumphant), a hunky leading man (tough and kind), and all sorts of evil brewing in the post-apocolyptic world (Chicago! )make this a little formulaic AND also a fun read. I watched the movie on a trans-Atlantic flight ... very good representation of the book and a fun guilty pleasure. A couple book chicks gave the suggestion to read it with the idea of looking for which quadrant you the reader would belong. That was somewhat helpful ... 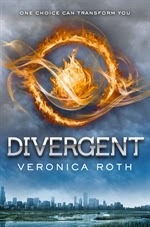 I wonder if the point of the book is that we are all kind of divergent. This one was just alright for me... but I thought the series actually got better (unlike Hunger Games), and I have heard the movie's excellent.